Lately many women have consulted me about color matching and color combination's. I found out how much women are afraid of color combination's and how deep they are captured by the conception of black and more black. So this post is dedicated to color. I don’t want to tell you in a simplified and superficial way which color combination's work and give you a list of colors that match. All colors have various shades and tones that affect the combination between any two colors. The type and texture of the fabric are also very important for a successful combination. One thing I can say – be daring, don’t be afraid of color. Take the item you want to match, for instance a skirt to which you want to match a blouse, place the two fabrics together for an initial matching and then try the two items on together, preferably with the final shoes you will be wearing. Take your time, think it through and consult with others. Try to stay away from black – I am sure you have many black items in your wardrobe. Different tones of brown, grey, blue and cream are excellent softer basic colors, to which you can match any color. These colors are the ideal basics for any woman. It’s important to learn how to use the base colors and match various colors to them. Fashion is fun, you just need to be daring and try new things. For instance, I match green, blue, ocher, eggplant or cream with brown. Grey works with everything, and the difference between grey and black is the softness – with grey you don’t get that salient contrast. You can work with the same idea when matching pantyhose (but please not tights). I have a large stock of pantyhose in various tones and thicknesses. You can find pantyhose with an intermediate thickness, which are almost see-through and will suit anyone. I’m also not a fan of pantyhose with no feet – I think the cut above the ankle creates an illusion of a shorter leg and is not flattering. Pantyhose shape the leg nicely, and add color and interest. A small tip – you can find pantyhose made of a delicate net, in beautiful tones of brown, cream and grey. Keep one of each color in your closet and you’re set. I especially added close-ups of these pantyhose in brown to this post. In my blog I present various color combination's that can set an example for you. I would be happy to receive questions through email. Please don’t hesitate to write to me and I will happily help and advise you. In this post I present the ‘Fold’ skirt in a thin soft woolen brown fabric, with a gentle Pepita pattern. The skirt’s shape is straight; it extends above the knee and has three folds in even distances in the front. To this skirt, I matched a cotton 'apple green' blouse. I love the combination of brown and green. The blouse has a gently pointed collar, and the sleeve – just above the wrist – is fastened with a thin rubber strip. You are all welcome to visit my point of sale in the Designer’s Avenue at Dizingof Center, on Thursdays and Fridays. You can also purchase my models at my online shop; you can find a direct link at the top of the blog page. See you! 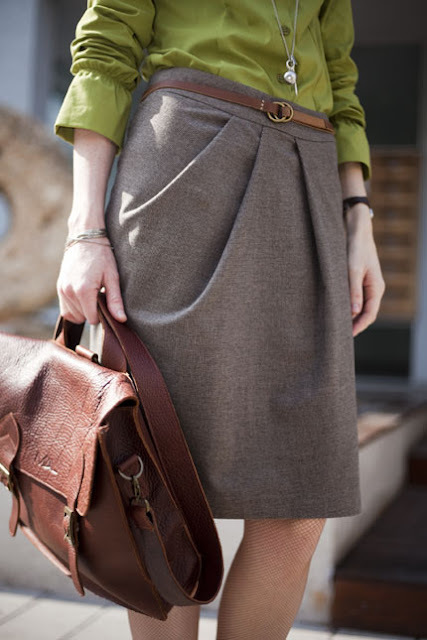 Ideal look for the elegant working woman.